William Kostric wears a 9mm pistol as he stands outside a town hall meeting on health care held by President Barack Obama, Tuesday, Aug. 11, 2009, in Portsmouth, N.H.
Who was that gun-toting anti-Obama protester? William Kostric wears a 9mm pistol as he stands outside a town hall meeting on healthcare held by President Obama, in Portsmouth, N.H., Tuesday. 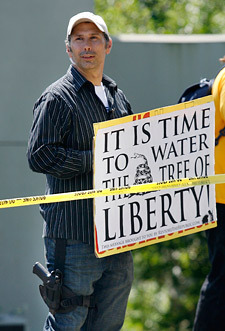 One of Tuesday's big mysteries was the motivation behind anti-Obama protester William Kostric, the man who brought a loaded gun to the town hall meeting and carried a sign referencing Thomas Jefferson's famous credo, "The tree of liberty must be refreshed from time to time with the blood of tyrants and patriots." On Tuesday afternoon MSNBC's Chris Matthews asked Kostric why he carried "a God-damned gun" to a meeting with the president, "given the violent history of this country with regard to presidents and assassinations," and whether he supported the Birther movement. Kostric insisted his intentions were peaceful, and that he's not affiliated with Birther groups. And on his MySpace page (h/t Lavender Newswire), Kostric also lists as one of his heroes Robert Schultz, the anti-tax activist and We the People founder who spent a ton of his own money on ads promoting the Birther movement. At a press conference in December, Schultz told reporters: "This nation is headed towards a vortex of a Constitutional crisis. While on the one hand, the Obama citizenship issue is so simple a schoolchild could grasp it, if left festering and unanswered, it possesses the potential to send our nation into a time of great peril." Kostric's MySpace profile also lists among his heroes Randy Weaver, the white supremacist and right-wing activist who survived the Ruby Ridge confrontation with federal agents, along with Ayn Rand's John Galt, Thomas Jefferson, libertarian/GOP presidential candidate Ron Paul and William Wallace, the Scottish resistance leader portrayed in Mel Gibson's "Braveheart." The profile also includes, as one of Kostric's "Top 12 friends," the Free State Movement, a group organizing libertarians to move to New Hampshire and expand on the state's "Live Free or Die" credo, and ultimately secede from the union. A "William Kostric" also signed two pledges at PledgeBank, a site that lets people organize around various causes. Kostric's two pledges include: "move to New Hampshire by 12/31/2008 where I will work to bring about a society in which government’s maximum role is protecting life, liberty, and property" -- the credo of Free State Movement members -- and "refuse to accept a national ID card," a cause among many far-right libertarians. "If people can't wake up and see why it's immoral to trespass and destroy someones property, kidnap and lock them in a cage for growing a plant in their backyard then perhaps a body count is what's required for change. "I personally feel zero sympathy for those cops. I reserve my sympathy for the victims of the nonsense they initiate." If Kostric really believes "perhaps a body count is what's required for change" in the case of cops moving against drug dealers, it would be interesting to know what other causes he thinks a "body count" might hasten along. The chances that the William Kostric who's left the Web footprints is not the William Kostric who became notorious Tuesday seem slim to none. Kostric told Chris Matthews that he protested the Obama event because the nation is "traveling down a road of tyranny." "Poor kid. I feel his pain. Maybe it's about time as I've generally been short on empathy. So Santa Claus is a metaphor for god, unconditional love or whatever we once believed in very strongly and now know to be false. Of course the intial realization causes some pain, disillusionment, insecurity, a laundry list of negative emotions. The big one for me was anger. What was the point of the lie to begin with? Then perhaps fear. If I was so wrong on this point, what else am I completely mistaken about? You begin to question everything and one day you realize that isn't a bad thing. You begin to enjoy the path of self realization. Or, you can choose to reject the real world and get plugged back into the Matrix, to go through life with your Eyes Wide Shut." "I would rather be ashes than dust! I would rather that my spark should burn out in a brilliant blaze than it should be stifled by dry rot. I would rather be a superb meteor, every atom of me in magnificent glow, than a sleepy and permanent planet. The proper function of man is to live, not to exist."